One of the first educational games marketed for the Apple II computer was called The Factory. Factories are all about sequencing a series of operations, in the correct and most efficient order, so as to produce a product. Sequencing is a basic skill needed for clear writing, mathematical and scientific problem solving, and computer programming. 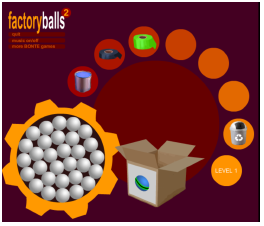 As good as The Factory was, an even better game is Factory Balls2, a free web game by Bart Bronte. The raw materials used in the factory are the white balls in the rotating gear. The product to be manufactured is pictured on the front of the cardboard box. The "machines" in the factory are pictured in the arc of small circles. The first product to be made is a blue ball with a wide green band around its equator and a thinner black band on top of the green band. To manufacture this product, grab a white ball from inside the gear and paint it blue by dropping the ball in the bucket of blue paint. Pass the blue ball over the green tape circle to put a green band around it. Finish by moving the ball over the black tape circle. This will place a thin black band on top of the green band. The completed product drops into the cardboard box, the box closes, moves off the assembly line and is replaced with a box picturing the next product to be made. If at any point in the process a mistake is made, drop the ball into the waste can and get a new ball from inside the gear. The game even saves your progress from visit to visit. As you move up the levels, the products get more complicated and therefore more complex to manufacture. The product to be manufactured in Level 8 is a blue ball with small yellow circles in the top hemisphere and small orange circles in the bottom hemisphere. The machine in the circle at the two-o'clock position masks the upper hemisphere of the ball. The machine at the one-o'clock positions makes the small circles. 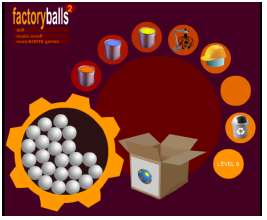 Factory Balls2 is easy to play, attractive, and exercises sequencing, an important problem-solving skill. As you move up the levels, the products become very challenging (even for grandad) to manufacture.